Old World Wine, In The New World! It means that virtually all processes are done by hand, including Planting, Picking, Crushing, Bottling, Corking, and finally, Labelling. It also means we use biodiesel fuel to run our tractors to reduce our environmental footprint, we recycle everything as best we can, and when we need to spray our vineyards, the materials are not synthetic nor petroleum based – they are organic! At Reimer Vineyard, we are passionate about the better stuff in life. 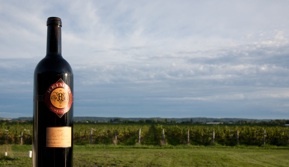 Located in the gorgeous green fields of Niagara-on-the-Lake, we specialize in creating first-rate wine at affordable prices. A man equally passionate about his organic vineyards and his award-winning wines! Art Reimer has been making wine on Lot 30 for over 30 years. What began as a hobby in the basement, has since matured to become award-winning amateur wines. It was in the year 2000, when Art began to investigate going organic on the farm. After witnessing a number of older farmers with health problems related to the pesticides they had used throughout their lifetimes, Art decided it was time to find a better way to do things. We are pleased to share Art's passion for winemaking with you! For more information, visit us or give us a call! Located in the gorgeous green fields of Niagara-on-the-Lake, we specialize in creating first-rate wine at affordable prices. Our beautiful vineyard specializes in organic wine and sustainable practices. We produce many varieties of wine. Visit us today! We are participating in many farmer’s markets around the area, click here to see when and where! Saturday 11 a.m. – 6 p.m.
Sunday 1 p.m. – 6 p.m.
Monday – Saturday 11 a.m. – 6 p.m.